Movie lovers will be running to the new Face Place Movie Photobooth. With films such as Wonder Woman and The Lego, Batman Movie, you will have families lining up to get their photos taken. The Movie Scene Photobooth embraces green screen technology to deliver an interactive photo booth experience like never before. Users are “dropped into a “Movie scene” of their choice. The selection of Hollywood blockbusters is constantly updated and provided by major Hollywood Studios such as Sony and Warner Brothers! Offer your customers exclusive photos with the characters and graphics from such hits as Suicide Squad, Wonder Woman and Justice League. 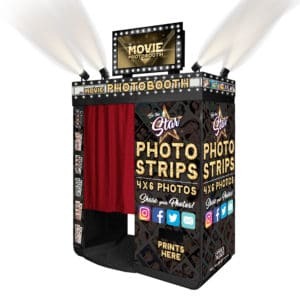 The Movie Photobooth also takes advantage of our cutting edge Smile 2.0 software that allows customers to share their photos on Facebook, Twitter, or by e-mail directly from the booth.